Dia de visita ao primeiro Parque Nacional dos Estados Unidos, criado em 1872, como área de recreio e ecossistema a preservar. Este parque, com uma área de quase 9.000 km2, cheios de floresta, rios, lagos e desfiladeiros, assenta num super vulcão, que ainda se encontra activo, e que é o maior do continente. A nossa rota passava por parte deste cenário maravilhoso, que fomos descobrindo à medida que atravessávamos o parque. Primeiro vieram os lagos, localizados bem no cimo das montanhas, e que fazem parte da caldeira do vulcão, depois foi hora de conquistar mais uma subida, desta vez mais uma montanha do Continental Divide. E assim que chegámos ao cimo nada como um placard informativo a explicar que o Continental Divide é uma cadeia de montanhas que divide o continente americano desde o Alaska até à Patagonia, e que determina quais os rios que desaguam no Pacífico e quais os que desaguam no Atlântico. Em Yellowstone tocámos num lago tranquilo, cheio de nenúfares. A água do lago tanto pode seguir para um lado, através do Rio Columbia, que desagua no Oceano Pacífico, como para outro, através dos rios Missouri e Mississipi, que desaguam no Oceano Atlântico. Depois foi hora de descer a montanha, o que é sempre do nosso agrado, enquanto nos deleitávamos com a vista da floresta, de pequenos riachos e de grandes cascatas, ao mesmo tempo que lidávamos com o trânsito, em bermas muito estreitas ou mesmo inexistentes. A certa altura o Pedro parou a bicicleta, pediu-me que a segurasse e voltou para trás na estrada. Tinha avistado um cão largado na berma, no fundo um pedaço de vida selvagem de Yellowstone, que resgatámos e que ilegalmente trouxemos connosco. Resolvemos baptizá-lo de Evan Dando, ora vejam lá se o descobrem nas fotografias! A hora de almoço foi dedicada à observação do “Old Faithful”, um geiser gigante que tem erupções, sensivelmente, a cada hora e meia, e que alguém descreveu, e bem, como uma cascata de pernas para o ar. O dia já ia longo quando a parte verdadeiramente interessante começou. Geisers e fontes hidrotermais, num cenário como nunca antes tínhamos avistado. A diversidade é tamanha, que as fontes hidrotermais vêem em diferentes cores, algumas com água ou lama a borbulhar, outras em diferentes profundidades e formas. Algumas ladeadas por rios, outras no meio de uma floresta já seca, outras ainda no meio de pradarias. Todas rodeadas de avisos para não pisar a fina crosta branca que as rodeia, já que a qualquer momento se pode abrir um novo buraco no chão, e a temperatura da água chega para nos cozer em menos de um minuto. 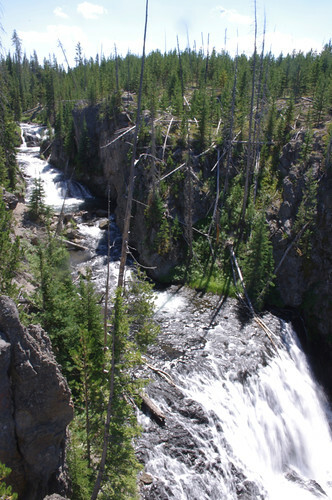 Em Yellowstone tudo está em mudança constante, e o ecossistema é bastante volátil. Pelo meio ainda houve tempo para mais um banho de rio, cuja temperatura não podia ser mais agradável, dada a fonte de água quente que lhe corre para dentro, e depois foi correr até ao novo parque de campismo, desta vez com uma quantidade de caixas à prova de urso muito mais razoável. Day visit to the first National Park in the United States, created in 1872 as an area of recreation and ecosystem preservation. 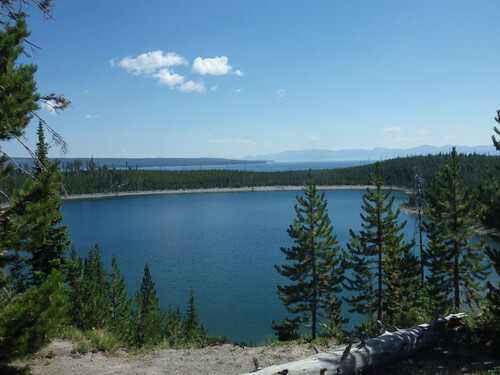 This park , with an area of nearly 3,500 square miles, with lots of forests, rivers, lakes and canyons, is based on a super volcano that is still active, and that is the largest on the continent . Our route passed by this wonderful setting, which we discovered as we rided through the park. 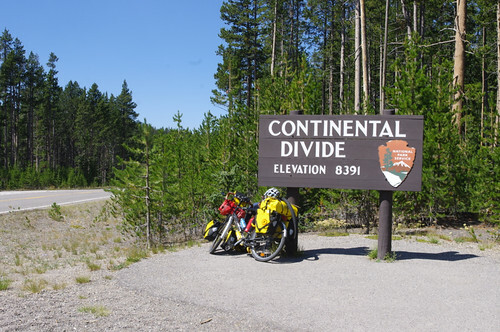 First we saw the lakes, located right on top of the mountains and that are part of the volcano’s caldera, then it was time to conquer hill, this time over a mountain of the Continental Divide. 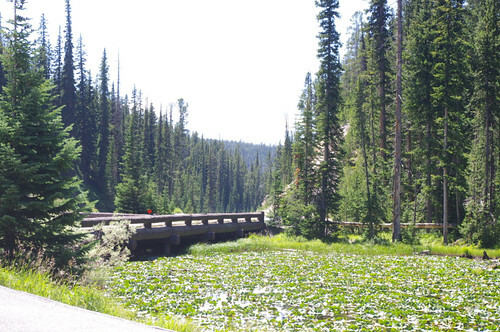 When we reached the top we learned in the information board that the Continental Divide is a mountain range that divides the American continent from Alaska to Patagonia, and determining which rivers flow into the Pacific and which flow into the Atlantic In Yellowstone we touched a tranquil pond full of water lilies. The lake water can either side, through the Columbia River, which flows into the Pacific Ocean or through the Missouri and Mississippi River , which flows into the Atlantic Ocean. Then it was time to get down the mountain, which is always something we really enjoy doing, and along the way we marveled with forest views, small streams and large waterfalls, a the same time we were dealing with traffic in very narrow or non-existent shoulders. 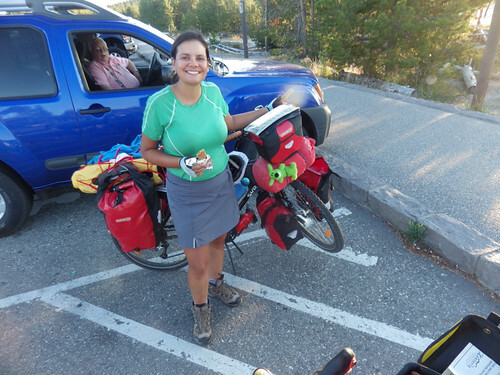 At one point Pedro stopped his bike, asked me to hold it and went back on the road. He had spotted a dog dumped on the side, a piece of wildlife from Yellowstone, that we rescue and illegally brought with us. We decided to baptize him Evan Dando, lsee if you can find it in the photos. 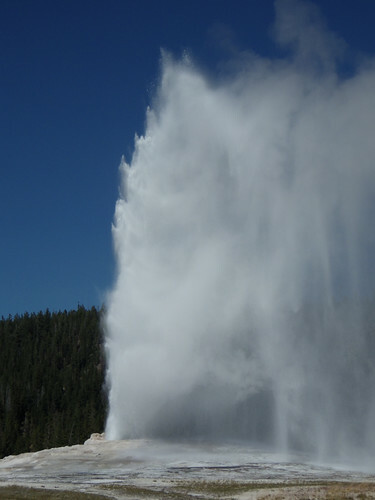 The lunch hour was dedicated to the observation of “Old Faithful “, a geyser that has giant eruptions, roughly every hour and a half and that someone accurately described as a cascade going upside down. The day was already long enough, when the really interesting part began. 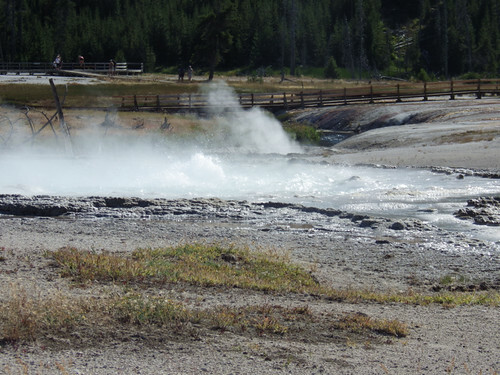 Geysers and hydrothermal springs, in a scenario like we never before had seen. Diversity is such, that the hydrothermal vents can be seen in different colors, some with water or mud to bubble , others in different shapes and depths. Some have some rivers nearby, others stand in the middle of a dry forest, others are still in the middle of the prairies. All of them are surrounded by warnings not to step on the thin white crust around them, since at any moment you can open a new hole in the ground, and the water temperature reaches in enough to bake us in less than a minute. 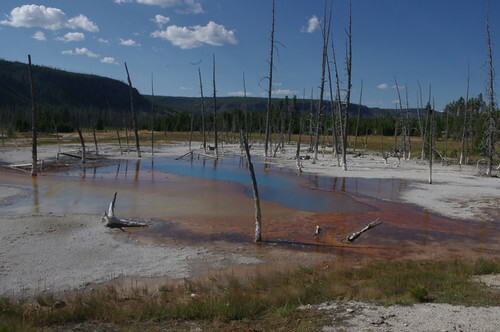 In Yellowstone everything is in constant change, and the ecosystem is quite volatile . There was still time for one more river bath, whose temperature could not be nicer, given the source of hot water that flows into it , and then run up to the new campground, this time with a much more reasonable number of bear proof boxes. Esta entrada foi publicada em natureza|nature, USA com as etiquetas Evan Dando, Wyoming, Yellowstone. ligação permanente. A paisagem é espectacular!! Sortudos.